AWESOME NEWS!!! 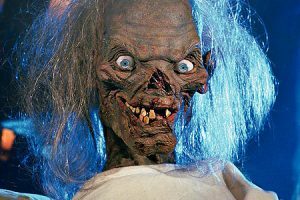 New ‘Tales From The Crypt’ Series Is In The Works!!!! It’s hard to believe it has ben fifteen ears since the HBO series ‘Tales From The Crypt’ finished its seventh season. I very much enjoyed that show growing up and always was very fond of the comics. Well it seems like a new TV series based on the popular and controversial 1950s EC Comics anthology is in the works with Gil Adler, producer on the HBO Crypt series, and Andrew Cosby, co-creator of Syfy hit Eurekaand co-founder of comic book publisher BOOM! Studios. The new show will be an hourlong series and, “It will be an ongoing series that uses characters from the comic books in a more modern context,” Cosby said. “It’s all about continually elevating the genre, for both existing fans of the source material and mainstream audiences.” The project and a pilot script is being worked on right now and then will be shopped around to broadcast networks as well as paid cable networks. There is a rumor that Cinemax might want to purchase this. This is all fine and dandy, but please please please bring back the cryptkeeper and use the same music. He was iconic and so AWESOME. Can’t wait to see how this project takes shape. Jason Patric Will Star In FX’s Comic Book Adaptation of ‘Powers’!!! Greg Mottola Will Direct Aaron Sorkin’s New Pilot For HBO!!!! Looks Like Cable Network AMC Is Interested In An Extra Terrestrial Show!!! This entry was posted on Wednesday, July 27th, 2011 at 5:59 pm	and is filed under Film, News. You can follow any responses to this entry through the RSS 2.0 feed. You can skip to the end and leave a response. Pinging is currently not allowed. « Kevin Smith’s ‘Red State’ Gets A New Poster, Trailer, and Early On Demand Release!! !